I'm sitting writing this in my newly sewn 1960's shift dress about to write up a story about a 1950's inspired dress. I sure do like to hop decades when it comes to my style! 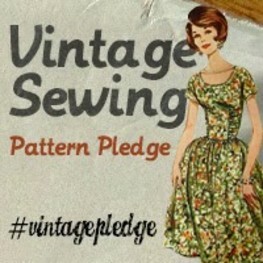 Next decade will probably be the 1970's as I have some vintage fabric from that period in my wardrobe ready to sew up. Every year in Australia we have what is known as Melbourne Cup Day. Melbourne Cup Day is Australia's major horse race. Marketed as "the race that stops a nation", it is a 3,200 metre race for three-year-olds and over. It is the richest "two-mile" handicap in the world, and one of the richest turf races. The race starts at 3pm on the first Tuesday in November. In Victoria it is a public holiday and for those other states in Aus we go to work in the morning then generally put pens down prior to the race and head off to events to drink, gamble and watch the race. We Aussies need any excuse for a booze up! Most workplaces hold an event and thankfully my work last year arranged a function on the top floor of the building with outstanding views of Sydney Harbour, canapes, champagne and the race shown on a big screen. But the real excitement for me was best dressed. I was very curious to see what people would wear and if it would be competitive. I hadn't planned on entering the best dressed and was reluctant to catwalk in front of colleagues on stage. However, one of the judges did walk around and determine who would enter the competition and thanks to some very supportive colleagues (who may have mentioned I had made the outfit I was wearing) I got up on stage. As luck would have it, I won! Tt might have had to do with my team yelling from the back of the room - schucks! The best bit was the prize. A $250 Qantas gift voucher to spend within the year. Yeah buddy! So what was I wearing? I had bought up some lovely printed cotton from Spotlight, one of their vintage reproduction fabrics with yellow roses on it. 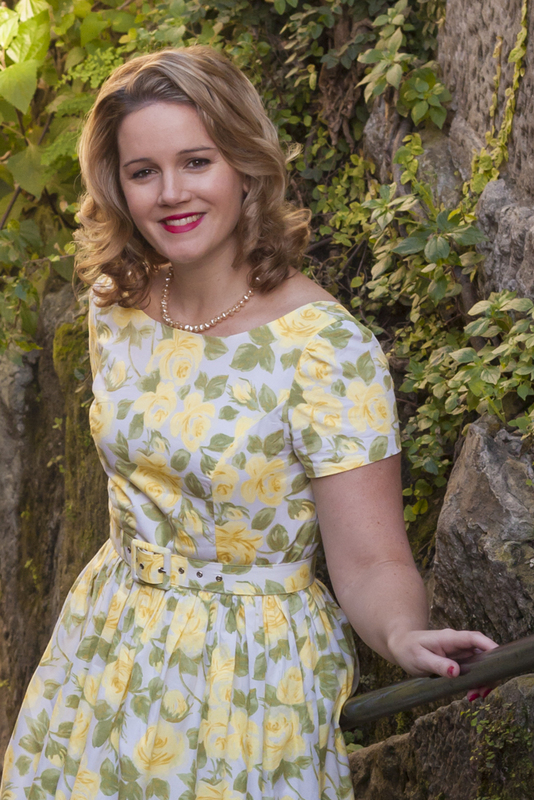 I bought about 5 metres of it because it was on sale, I loved it, and any 1950's style dress takes up a hell of a lot of fabric. I had an idea of what I wanted to make up but I didn't actually have a pattern that matched it directly, so it was mash up time! 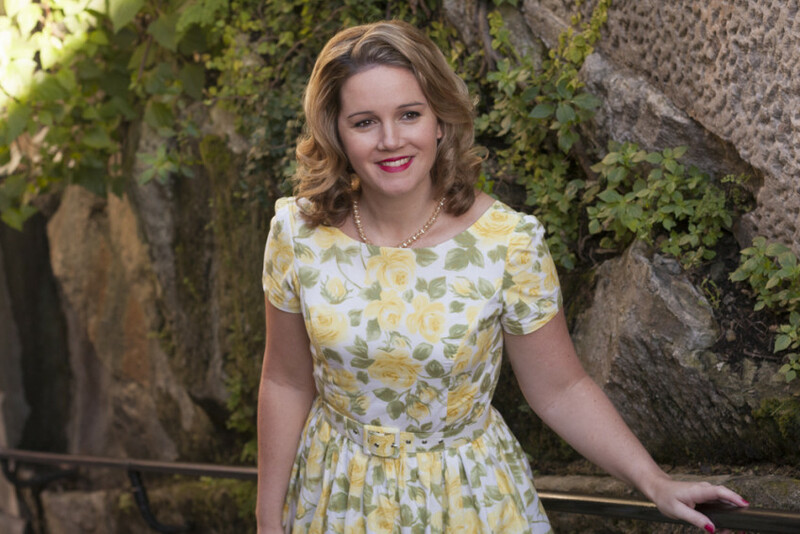 I used the bodice of Simplicity 1873 but grafted it so it had a higher neck and a lower back finish. 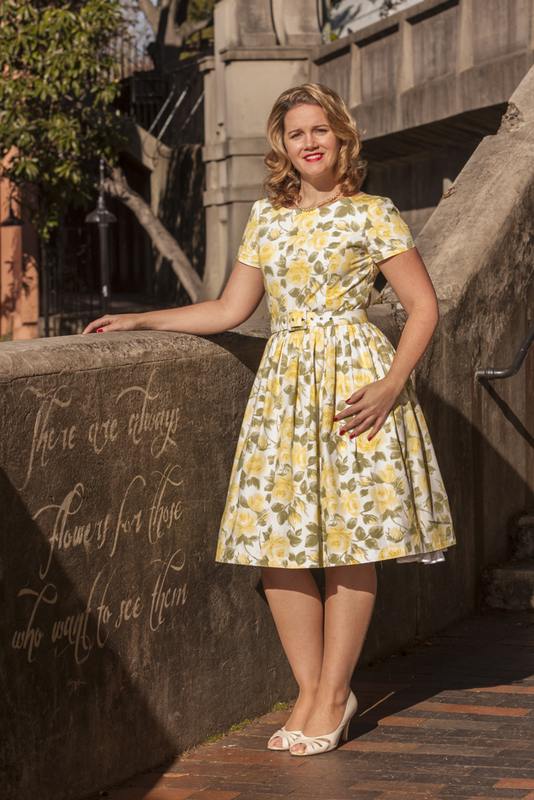 I then used a gathered skirt pattern from Vogue 8723. I also took a sleeve pattern from unfortunately I dont know where. My memory has quickly faded. Most shirt sleeves from a shirt pattern would do the trick. I bought white cotton voille to line the bodice and kept the sleeves unlined. It was quite easy to pull the different pattern pieces together. What made it easy was that it had a gathered skirt which can adjust to how you want it to the bodice. There's no matching seams, darts or pleats. I did add about an inch to the skirt bottom so it fell under the knee. Adding the sleeves was a little trickier so that required a couple of fittings as I went along. I opted to have the zipper go down the side seam rather than back as I was a bit concerned that having lowered the back it might end up gaping at the top of a zipper. By having it on the side it is well hidden. 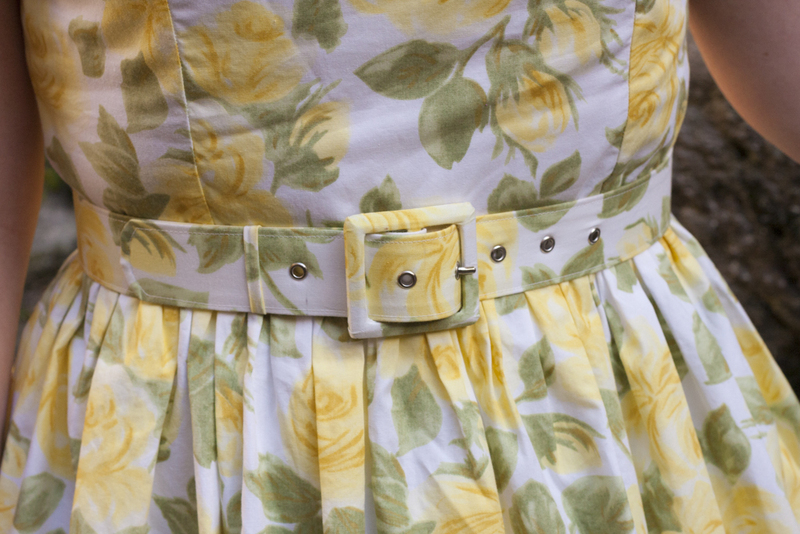 I wanted to try out doing my own matching fabric belt again and used the advice, tips and tricks from Sunni of the blog A Fashionable Stitch. 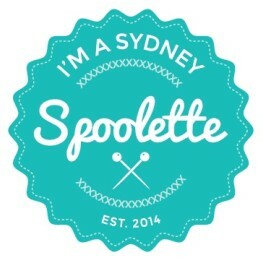 Sunni has an excellent step by step guide on her blog and on top of that she also used to sell belt kits with everything you need bar the eyelet tool. I still had a couple of kits at home to choose from. I checked out her shop recently it looks like she sells the belt parts seperately now and not in kits, but just follow the instructions and you'll know what you need to get and how to do it. It is a finicky to make up but I enjoyed the process and when you get a good outcome it is very satisfying! My tip is to stick with using fabrics which aren't too thick. My first belt making attempt the fabric was too thick and it just didn't work well. But most lightweight cottons will wodo the trick. Next time I am planning on making one with piping on the edges - will be tricky! 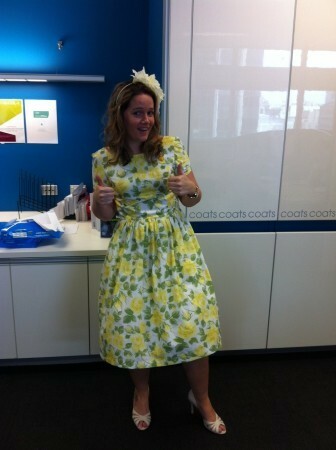 Me looking classy before the office Melbourne Cup function! what a beautiful Dress! perfekt fit! great Job!! Thank you. I do think of Betty when I see it too, I love her style! Featured on Sassy Sewing Bees Facebook page. Very well done on the dress! I totally see why you won a prize! Super adorable. 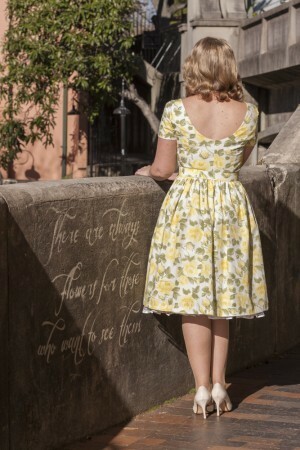 I just discovered your blog and had to comment on the cuteness of this dress! Lovely, lovely, lovely. Clever you with the mashed up, mixed up dress. Haven't attempted a franken-dress yet. If they end up looking as fabulous as yours I'd be onto a winner! Your dress is absolutely gorgeous! I've made myself a skirt from that very same material. It's one of my all time favourite materials from Spotlight. You look lovely in your photos. The dress is very Betty Draper. Thanks! I bought up about 8 metres of that fabric when it was on sale, I love it. Sometimes Spotlight gets some lovely vintage inspired fabrics in - you jst have to go rumaging.